Seattle Pacific University is the first private college in Washington state and one of only three schools in the Council for Christian Colleges and Universities (CCCU) to receive national accreditation for a Ph.D. program in clinical psychology. In May 2007, SPU was notified by the American Psychology Association (APA) that it had been granted accreditation for seven years, the maximum duration APA will approve and a rare honor for new programs. Seattle Pacific’s doctoral program was launched in 1995 and formalized into the clinical psychology Ph.D. program in 1998.The University’s School of Psychology, Family, and Community (SPFC) spent the intervening years working to meet the exacting requirements for APA accreditation. As with all secondary accreditations, clinical psychology programs must be well established before they can even apply, and then must begin a lengthy process of meeting specific criteria in a variety of scholarly and professional areas. The SPU Ph.D. program is unique because of its dual emphasis on scientific research and clinical practice in a Christian university context. Clinical psychology students care for youth, adults, and the aging, while developing therapies for patients with emotional, behavioral, family, and medical disorders, as well as mental illness. Graduates go on to serve in universities, clinics, hospitals, and mental health centers. For Michael Tandy, who earned his Ph.D. in clinical pyschology at Seattle Pacific in 2007, the accreditation is well-deserved. “SPU’s program prepared me to be licensed rapidly and put me in contact with several employers who have extended job offers,” he says. Tandy works in therapy and assessment at Meier Clinics of Seattle while preparing for licensure. 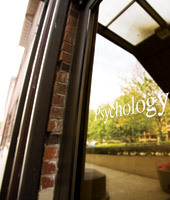 SPU's doctoral program in psychology is now in an elite group nationwide. The largest and most ethnically diverse freshman class arrived on campus this fall. The action-packed Homecoming and Family Weekend is January 24-26. Four SPU faculty members retired with a combined 129 years of service. Dying big-leaf maple trees removed from Tiffany Loop. SPU moves ahead with a master plan for developing 82 acres. The late Dr. Winifred Weter left SPU a gift of $4.83 million.